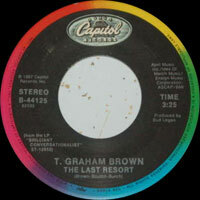 Chanteur Country US né Anthony Graham Brown, le 30 Octobre 1954 à Arabi (Georgie). 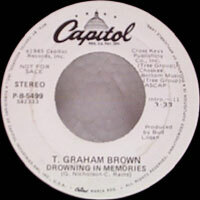 T. Graham Brown rose to country stardom through the uniquely Southern phenomenon of beach music, a party-ready mix of old-time rock & roll, R&B, country, and blues. Born in Arabi, GA (his real first name is Anthony), he got his start performing while attending the University of Georgia, as part of the beach-music duo Dirk & Tony. He then joined the outlaw country band Reo Diamond, and retooled his image as a hairy, tattooed wildman in a ten-gallon hat. 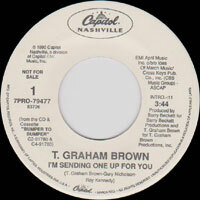 Moving on in 1979, Brown formed his own R&B band, Rack of Spam, and officially settled on T. Graham Brown as his stage name. He moved to Nashville three years later, where with the help of Harlan Howard he found work singing demos and commercial jingles. In 1983, he signed with CBS as a staff songwriter, and went on to join the Tree International publishing firm in the same capacity. Meanwhile, he also landed a deal as a recording artist with Capitol, and released his debut album, I Tell It Like It Used to Be, in 1986. Partly recorded at Alabama's legendary Muscle Shoals studios, the record spawned a number one country single in "Hell or High Water," and both the title track and "I Wish That I Could Hurt That Way Again" went Top Ten. 1987's Brilliant Conversationalist gave Brown a second number one in "Don't Go to Strangers," and two more Top Tens with "She Couldn't Love Me Anymore" and the title cut. Meanwhile, he made appearances in the 1987 films Greased Lightning and Cursed, and the following year he and his backing group, the Hardtops, played Elvis' band in Heartbreak Hotel. 1988's Come as You Were continued Brown's success with the chart-topping "Darlene" and two further Top Tens in the title track and "The Last Resort." 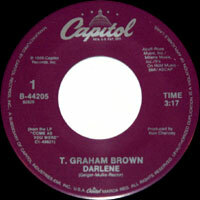 Unfortunately, Brown was also battling alcoholism, and his problems began to take their toll on his career. He managed one further Top Ten country hit in 1990's "If You Could Only See Me Now," and also duoed with Tanya Tucker on the hit "Don't Go Out" that year. But after his 1991 album, You Can't Take It With You, missed the charts, he found himself dropped by Capitol, and spent most of the '90s sorting himself out. He finally returned in 1998 with the acclaimed comeback effort Wine into Water, which reaffirmed his roots rock leanings and marked his most personal effort to date. 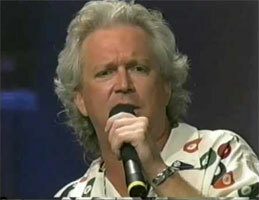 The concert album T. Graham Brown Lives! appeared in 2001. 08/1987 SP CAPITOL B-44061 (US) She Couldn't Love Me Anymore / R.F.D.